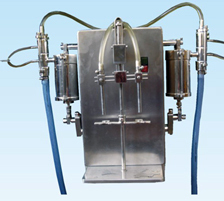 VOLUMETRIC LIQUID FILLING MACHINE : This unit is used to fill liquids in pharmaceuticals. Beverages, chemicals cosmetic industries. All the contact parts are manufactured from S.S. 304\316 quality as per product requirement. The drive mechanism is enclosed in a mild steel, frame cladded with stainless steel. 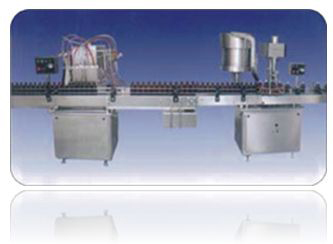 Machine is manufactured for various fill volumes and in models having 1, 2, 4, 6 & 8 filling heads. Separate syringes for fills smaller than the machine ordered and which can be fitted on the same drive are also available.